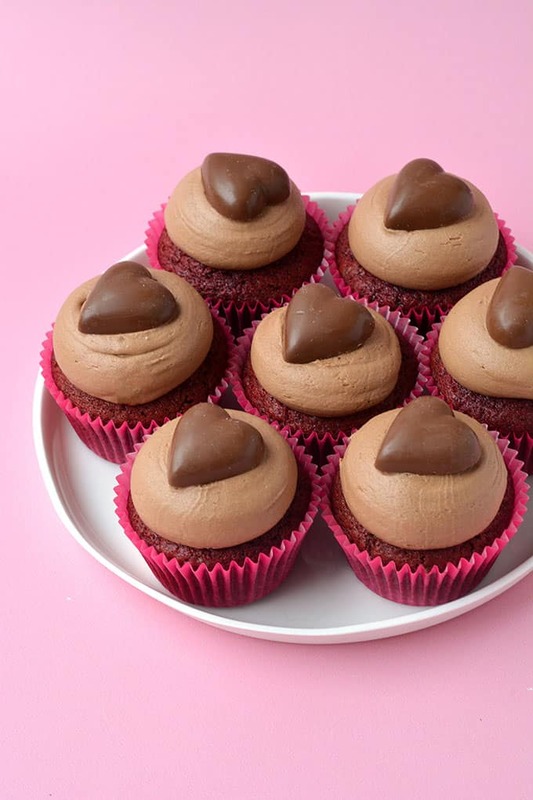 Celebrate Valentine’s Day with these gorgeous Red Velvet Cupcakes. 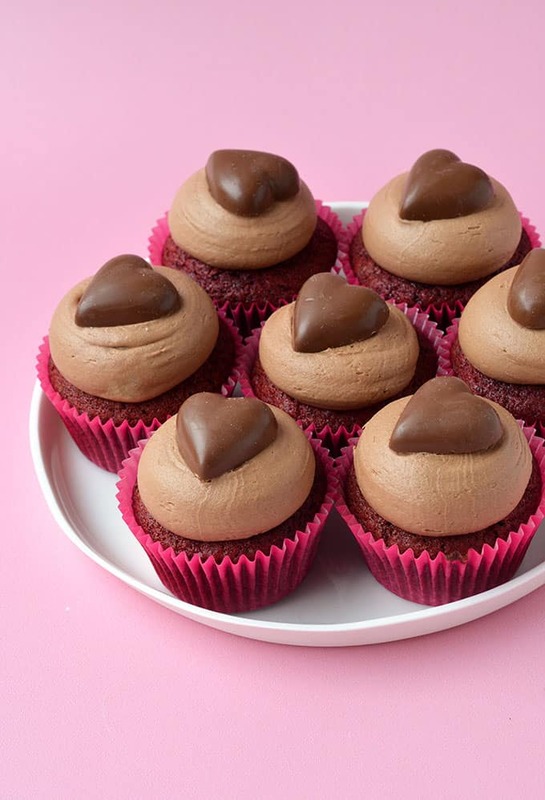 Homemade red velvet cupcakes covered in clouds of real chocolate frosting and topped with a chocolate heart. With Valentine’s Day just around the corner, it’s the perfect time to celebrate with a little Red Velvet Cake – who’s with me? 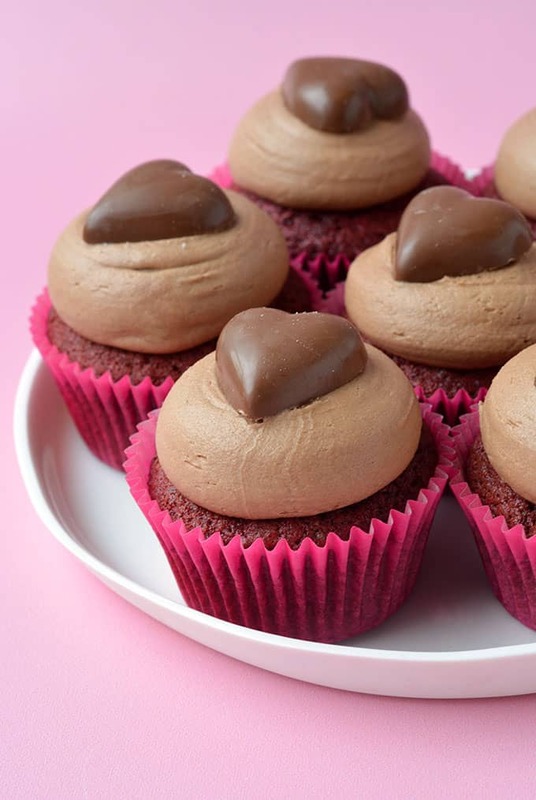 These gorgeous Red Velvet Cupcakes are soft and sweet, and topped with clouds of chocolate buttercream made with real chocolate. Perfect for your loved ones! Red Velvet Cake is one of my favourite cake flavours. I’ve had a gorgeous red velvet cupcake from Sprinkles in Los Angeles and one from Hummingbird Bakery in London. And this is my homemade version. While, red velvet cake is usually served with cream cheese frosting, I’ve added a sweet, silky smooth chocolate buttercream – and trust me, it pairs beautifully with the gorgeous red velvet cake. Most people who have never had red velvet cake before think it’s either strawberry flavoured or tastes like chocolate cake. It’s easy to see why that’s the case, when most red velvet cakes are vibrant red in colour and cocoa powder is generally used as an ingredient. But neither of those rumours are quite true. Red Velvet is more like a buttery vanilla cake that has a hint of cocoa. It is neither here nor there. Neither vanilla or chocolate. But there is something about this in between flavour that really hits the spot. These Red Velvet Cupcakes are soft and fluffy on the inside, with a truly tender crumb. And the chocolate frosting is just the icing on the cake. 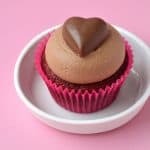 Chocolate buttercream made with cocoa powder is good, but sometimes, for an extra special treat, I make my frosting using real chocolate. 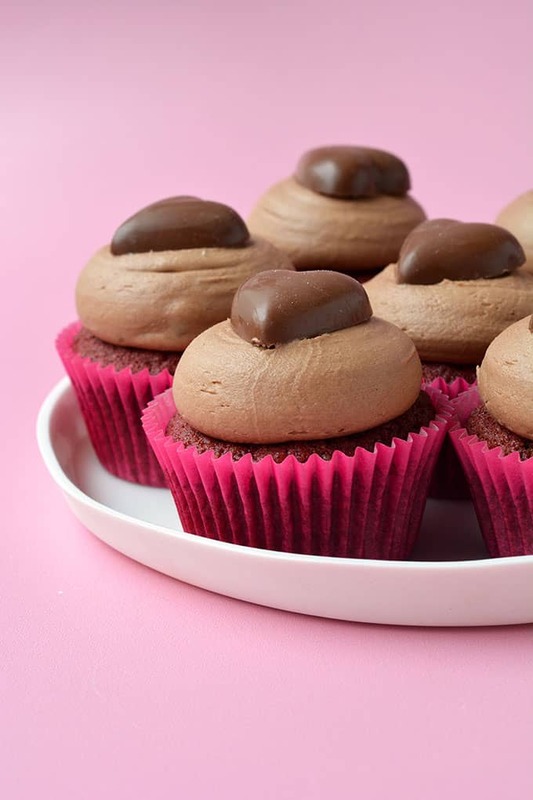 It’s really easy and it adds an extra depth of flavour, making your frosting smooth and luscious. I usually use dark chocolate (semi-sweet) rather than milk chocolate, as you already have the sweetness from the sugar and butter – what you need is that rich chocolate flavour. 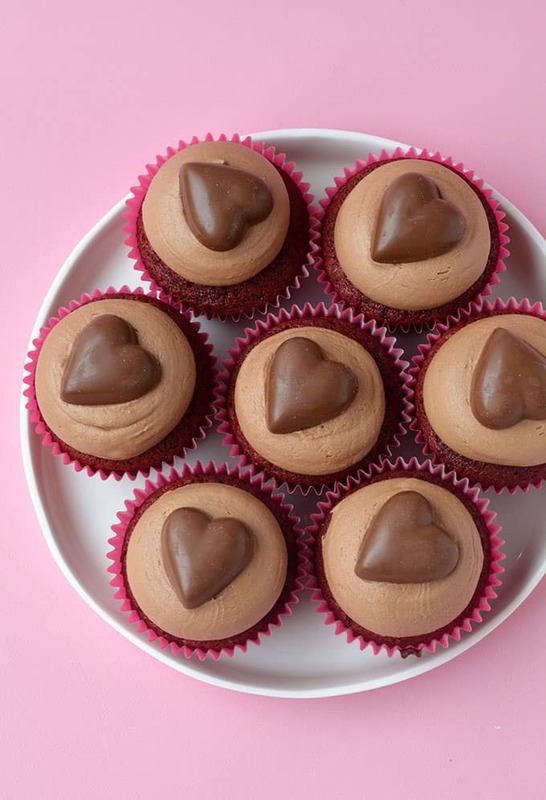 The finishing touch is a chocolate heart – perfect for Valentine’s Day or just because 💕 No matter the occasion, everyone will fall head over heels for these delicious homemade Red Velvet Cupcakes. This recipe was first published on Sweetest Menu in July 2016. So glad you enjoyed them Josh!! Red velvet has definitely always confused me! Lol. It’s not something we had growing up, and then all of a sudden it was this BIG thing but I never really knew what it was?!? LOVE the idea of pairing chocolate with red velvet! Ah Jess, you’re not the only one! I can’t tell you how many times this has happened with me, especially with remote controls and books!! It’s right there in front of me but I just can’t spot it when I need it! I could swear there was something paranormal happening with me LOL! But now that I know I’m not the only one, it’s a relief! We can at least cross mysterious ghosts off the list hahaha!! 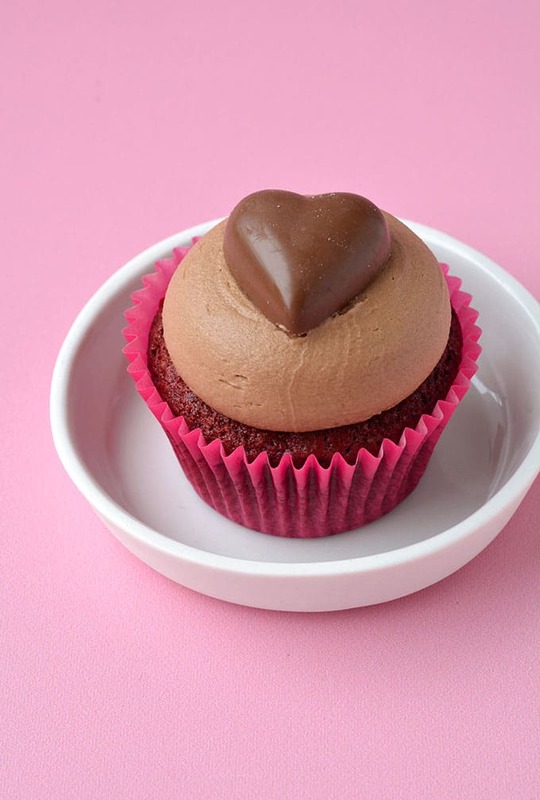 I love the pairing of red velvet and chocolate – I’ve never seen it before but I have to try it soon! And you definitely aren’t the only one. I am always guilty of thinking I’ve lost my phone, madly searching through my handbag, only to find that it was in my hand all along… #yourenottheonlyone. Red velvet cupcakes were actually the cupcake that started my baking addiction! It was the first recipe I ever made completely from scratch by myself and I was hooked from there! 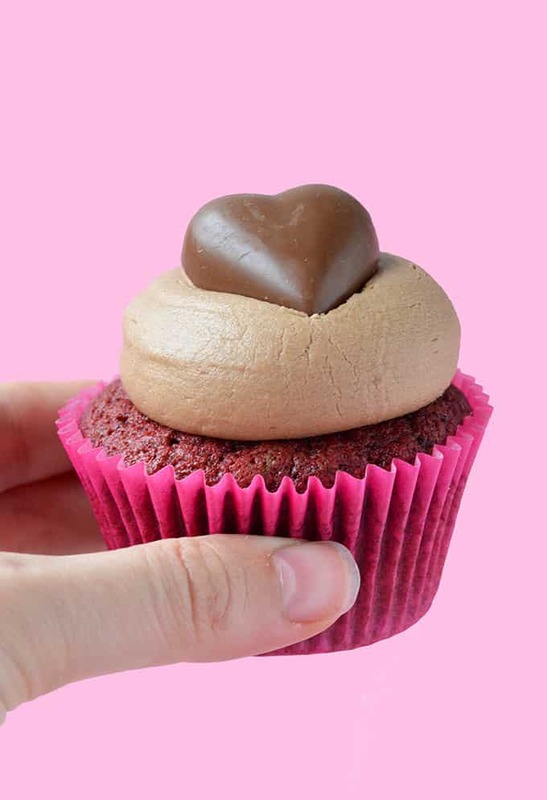 I even wanted to open up my own cupcake shop before being diagnosed with coeliac disease as I was constantly creating cupcake creations – but then cupcakes became mainstream and I decided they were boring haha! These are pretty as a picture! Red velvet always seems special to me. And that frosting! I just want to grab a spoon! Hahaha, hidden in plain sight! That’s the worst! Sounds like your mom had a pretty sweet celebration anyway 🙂 I LOVE red velvet with chocolate frosting… It really does make a wonderful complement of flavors on the palate! And your cupcakes are so gorgeous! My favorite way to decorate RV is with those beautiful red crumbs! Right?! I thought I was losing my mind! haha 🙂 Aww thank you Lynn! Oh my gosh those cupcakes look so moist and delicious! I love the method of making them (mainly not requiring a mixer for creaming 🙂 ) ill definitely give these a try! I love your recipe for red velvet cupcakes. I wanted to copy this recipe but when I tried it was 9 pages long. ridiculous. I guess we are not to suppose to copy these recipes. Hi Joyce, I’m not sure what happened but there is now a print button under the recipe title that should help! I hope you enjoy these cupcakes!